Congratulations tops national testing qualifiers! Congratulations to the 2018 tops national testing qualifiers! 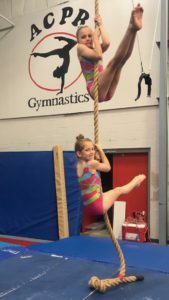 Kaleigh Fuchs and Mallory Brosh – eight-year-olds. They will be traveling to Indianapolis, Indiana in October for testing. Recreation Classes in the Churchville Rec Center will follow Harford County school closings that are due to INCLEMENT WEATHER! *Classes closed for weather are made up at the end of the session! Congratulations to ACPR’s 2019 Regional Qualifiers Level 8 – Kylie Bomhardt Level 10 – Anna Hill Level 8 – Katelynn Eby We are so proud of you! Good luck at Regionals!